Ma Jian was born in Qingdao, Shandong Province, East China in 1953. He lived and worked as a writer, photographer and painter in Beijing, then later in Hong Kong, before moving to London in 1999. A political dissident then and an outspoken critic of Communist China ever since, his award-winning literary works of his travels through China and Tibet lent voice to his country's "lost generation." His most famous book, "Beijing Coma," was published in 2008 and likewise garnered numerous awards. For his book "The Dark Road," published in 2013, which explores China's one-child policy, he traveled extensively through the country's remote interior. His political activism and demand for free speech have landed him in prison and prompted the ban of his books for the past 30 years in China. They have, however, been translated into numerous languages and have been published in Chinese in Hong Kong and Taiwan. Ma Jian is a 2017 guest of the German Academic Exchange Service in Berlin. DW sat down with him to discuss the Communist Party congress taking place in October. DW: What are your expectations of politics in China for the future? Ma Jian: Following the era of Jiang Zemin and Hu Jintao, we are now faced with Xi Jinping. The older generation of revolutionaries at least had a connection to the people. They believed that China's Communist Party was created for the people. Of course, they were also very privileged, and in my opinion, that was hypocritical, but they maintained that they were "respecting the people," as Prime Minister Wen Jiabao once said. Xi Jinping is part of the "second red generation." His Communist experience is limited to his youth membership in the Red Guards and that his father was part of the Communist Party's inner circle. His first important function was as secretary of various party cadres. That is how he gained more power. How does he express that? His sense of power and dominance are quite marked, to the point that he feels the state belongs to him. He considers himself the sole leader. The notion that people could vote for someone else is completely foreign to him. Since the "second red generation" has been in power, one has to take a look at North Korea to find something comparable in the way it can wreak havoc. In that kind of atmosphere, a different kind of political consciousness cannot emerge. Nor can a new class consciousness. China will position itself against the West more and more in the future, and will distance itself more and more from shared values in political and economic spheres. Many Chinese people look back to the 1980s. Why are you and others so interested in that decade? It was a period of transition and upheaval. For many young people, the '80s was an era in which they got a taste of freedom for the first time. They could paint, wear jeans and let their hair grow long. And more than anything, they could begin reflecting about who they were. This explosion of a sense of individual consciousness brought with it an intense demand for freedom. We began reading books from the West, to doubt the politics of our country. For me and for many of my generation, it was the start of forging one's one path. At the same time, we realized that China was completely decaying as a state. Once we saw the light, it was impossible to seal off China again. It had to begin opening up bit by bit. We realized at the time that thinking freely and personal liberties must be fostered. Education was necessary. And one had to pursue those matters oneself. What is the biggest difference to today? At the beginning of the 80s, we were all searching for freedom. We believed that the greater the distance we left Beijing behind us, the better. When we traveled to Tibet, we considered it a trip to the end of the Earth. But there were others who went abroad, to Germany, Great Britain and the US. It was a huge realization for us to see that one could leave China and go far, far away. In addition, many realized at the end of the 1980s that the Chinese system had to change since demand for openness and reform had grown stronger. That led to the protests at Tiananmen Square in 1989. This strong movement was an amazing thing. Within a month, people understood that they could stand up, that they no longer had to bow down. Even if that movement was quickly suppressed, in the long term, it strengthened the wish among Chinese people for more personal freedom, independence and the hope for democracy. The tanks and massacre at Tiananmen Square had a violent, brutal end, but the seeds of hope for democracy in Chinese society had been planted. We also noticed that the Communist Party, after crushing the democratic movement, had to change in order to stay in power. It opened up in the economic sector. This liberalization led to more Chinese raising their expectations for material goods and a better standard of life. There was an amazing force that led to China becoming a global economic leader within just a couple of decades. But the country still has a major problem: the Communist Party has never reformed itself politically. On the contrary, the control has tightened up. Rather than opening up more over time, it has become more conservative. Now we see that China has a problem that was never solved after 1989. After the tanks squashed political consciousness and the morale of the people, we see a China that is now richer, but also sadder and scarier than before. It possesses no humanity whatsoever. The Communist Party keeps its people well-fed, but cooped up in a pretty cage. It offers them no freedom or space to develop their own individuality and way of thinking. You traveled around China for three years during the early 1980s. You later wrote in your travelogue "Red Dust" about society back then. For your last book, "The Dark Road," you traveled along some of those routes again. What changed over time? People no longer have a political consciousness. When they talk about the US and Europe these days, then it's always in relationship to China and that it's superior. "America and Europe are nothing special; they are worse off than we are," they think. They believe that and constantly repeat things like: "The climate conditions are much worse there than they are here." Regardless of what it's about, they always think the West is worse off than China. You aren't the only famous Chinese person to be living in Berlin. There are also the authors Yang Lian and Zhou Qing, the artist Ai Weiwei, the journalist Zhang Miao and others. Why is the German capital so attractive to Chinese intellectuals? What I like about Berlin, as opposed to London, where I've lived for a long time, is the political consciousness among the people, and the sense of history. They feel stronger here than anywhere else I have lived. When you walk down the street, you come across "Stolpersteine" (Stumbling Stones) that recall people who were persecuted by the Nazis. I always stop and run my finger across them, and take pictures. Also, all across the city, you run into references to and memorials of the East-West history and division of the city and the country. The Chinese Communist Party is cracking down on corruption and disloyalty within its ranks. Human rights groups warn that it is casting its net to catch more than just political dissidents, it’s vanishing anyone it considers problematic. 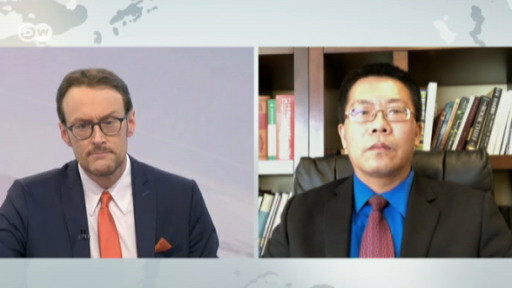 Brent Goff spoke to Teng Biao, a human rights lawyer and activist whose fight for human rights has landed him in hot water with the authorities.